Hokusai is a wood block painter from the Katsushika district of Edo, Japan at around the 1760s. He was born into a family of artisans. His father was a mirror maker believed to be making mirrors for the shogun. At the age of 6, he learned how to paint possibly from his father given that the mirrors were embellished with images at their sides as their design. At the age of 12, he was sent to work in a bookstore and library – an institution that was patronized by most middle and upperclassmen in Japan. Hokusai then became an apprentice of a wood carver at the age of 14 where he worked and learned the ways until the he was 18 years of age. He was then accepted into the studio of Katsukawa Shunshō where he mastered the ukiyo-e, or wood block painting, which typically depicts courtesans and Kabuki actors. After a year passed, Hokusai was dubbed by his master as Shurō (a name change is typical of Japanese artists because it marks the periods of their life and works). 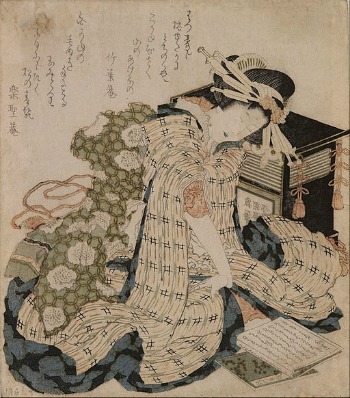 It is in this name that the Japanese artist published many print work with images of courtesans, Kabuki scenes and actors. In 1793, he was exposed to European artistic styles with his acquisition of French and Dutch copper engravings. Shunkō, the main novice of his master expelled him from the school. Hokusa’s work developed from purely painting courtesans and the Kabuki – he also learned to paint scenery and landscapes of the day-to-day lives of the Japanese people spanning from all walks of life. This was Hokusai’s innovation and major contribution to the ukiyo-e.
Ukiyo-e refers to woodblock prints produced during the Edo era. The term “ukiyo-e” is a Buddhist term, which originally refers to “floating world” denoting the transience of the world we live in. Originally, the prints were in black and white but soon evolved to include more colors. The making of an ukiyo-e print uses a separate block of wood for every color. The details of the prints are finalized by overlaying a black outline that serves to give life to the flat colors. An ukiyo-e print is distinct for its use of black lines containing bright colors and minimalistic design. Hokusai’s most renowned work entitled, The Great Wave off Kanagawa, also known as The Great Wave, is part of a series of landscape paintings entitled, The Thirty Six Views of Mount Fuji. The series showcases the famed mountain in different seasons and points of view. Apart from copper engravings, Hokusai also acquired Dutch prints though the Dutch trade. 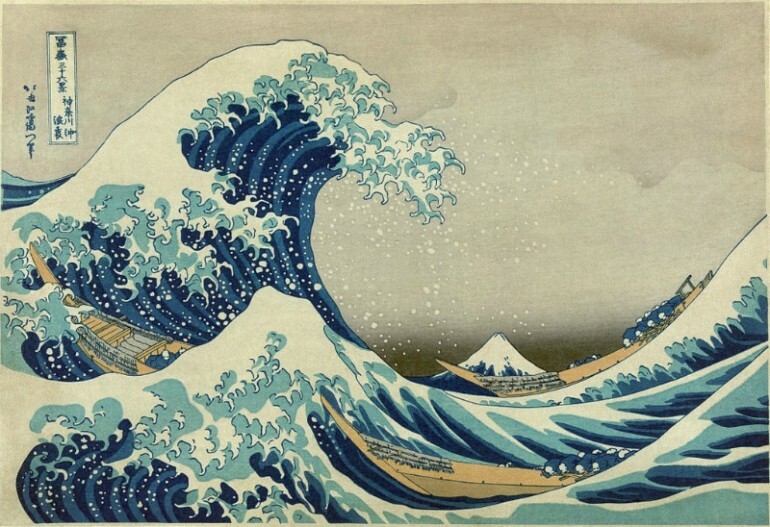 This was apparent in The Great Wave as seen in the use of linear perspective through a low horizontal line and the use Prussian blue, a popular color used in European art. The ukiyo-e artist was fascinated in the image of Mount Fuji because it was considered sacred in the Japanese culture. At the same time, with the flourishing of domestic travel – images of Mount Fuji has been lucrative. The main audience of the series are the pilgrims of the so-called Fuji cult and tourists who but paintings as souvenirs. The series The Thirty Six Views of Mount Fuji is the height of Hokusai’s career. His work became so famous that he added 10 more works in the series. His contributions to the world of art was Japonism which refers to the popularity of collecting Japanese art especially ukiyo-e prints. These were first spotted in Europe particularly in Paris when artist Félix Bracquemond gain access to a copy of the sketch book Hokusai Manga. Even with Japan’s relative seclusion, Hokusai successfully incorporated Western influences in his art. At the same time, he also caused waves of influences to the distant West.